This is a fabulous fall dish, rich and hearty with the taste of garlic, pancetta and saffron and in keeping with the bounty of the season by using butternut squash that is roasted and caramelized before being added to the risotto. I, like many cooks, kept my distance from risotto for a long time and should not have. It’s not difficult but it does require some tending as the mixture has to be stirred occasionally (but thankfully not continuously). I served this when I had a friend over for lunch and it was so good I just wanted another bowl of it for dinner; so I did! That attention it requires? So worth it. Enjoy! This dish is definitely worthy of being served at your Thanksgiving table; so in keeping with seasonal favorites and delicious enough to warrant the ‘holiday’ label! 1 butternut squash (2 pounds) - I did a Sandra Lee; butternut squash already cleaned and cubed at Costco...the extra price was so worth it! Peel the butternut squash, remove the seeds, and cut it into 3/4-inch cubes. You should have about 6 cups. Place the squash on a sheet pan and toss it with the olive oil, 1 teaspoon salt, and 1/2 teaspoon pepper. Roast for 25 to 30 minutes, tossing once, until very tender and starting to brown. Set aside. Meanwhile, heat the chicken stock in a small covered saucepan and keep on low heat during preparation. Melt the butter and saute the pancetta and onion on medium-low heat for 8 minutes, add the minced garlic and saute for 2-3 more minutes until the onion is translucent but not browned. Add the Arborio rice; stir to coat the grains with the butter and cook for one minute; add the wine and cook for two minutes. Add the saffron, salt and pepper; put in two ladles of the warm stock (approximately 1 cup). Simmer and stir occasionally until the stock is absorbed, 5 to 10 minutes. Continue to add chicken stock, two ladles at a time. Stir the mixture every few minutes and cook until the moisture is absorbed, then add more stock; continue until the rice is cooked through, but still al dente, approx 30 minutes. Remove from heat and add the roasted squash and Parmesan. Mix gently; serve with additional parmesan sprinkled on top. 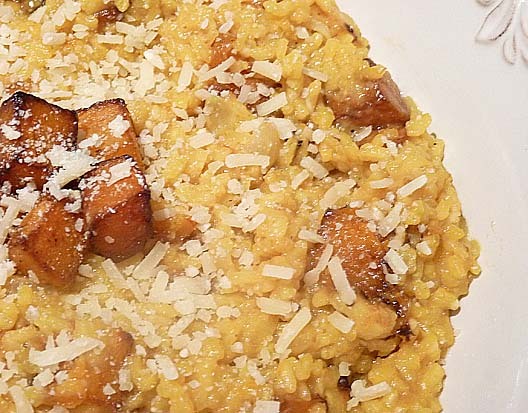 This is a fabulous recipe for risotto and a fabulous recipe for pumpkin. I love the flavors you've blended to jazz up an otherwise nice homey dish to make it even more special. I love your recipes. Thanks Jamie and the same back to you…it’s mutual foodie love! Love this dish. I wish we have butternut squash but we only have pumpkin. This dish looks really good most especially with the bacon and the saffron.